It most certainly doesn’t take long! 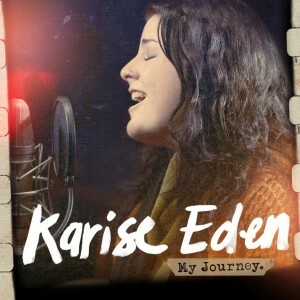 Newly crowned ‘The Voice’ winner Karise Eden’s debut album ‘My Journey’ (cover art pictured) will officially hit retail next Tuesday. The album will feature Karise’s debut single ‘You Won’t Let Me’ which, at No.4 on iTunes, is being held off the top spot by three other Karise performances in ‘Stay With Me Baby’, ‘Hallelujah’ and ‘If I Was Your Girl’. As we publish this story, she’s also in the iTunes chart at No.6 with ‘Nothing’s Real But Love’, No.8 with ‘Landslide’, No.11 with ‘It’s A Man’s World’ and No.15 with ‘Back To Black’. ‘My Journey’ will feature Karise’s performances from the show along with a selection of new recordings inspired by her journey both on the show and through life. ‘My Journey’ will hit the shops on Tuesday June 26.